$2,000 in Fines for Dredging and Filling Shore Lands. 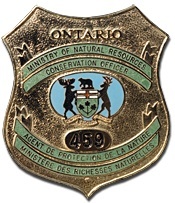 Two Espanola men have been fined $2,000 for dredging and filling shore lands fronting the North Channel in Sheguiandah Township. Kevin McCulloch, owner of the property, and John Olinsky, owner of the equipment used, pleaded guilty to unlawfully dredging and filling shore lands without a work permit. McCulloch was fined $1,500 under the Public Lands Act and issued a court order to restore the site to its natural state. Olinsky was fined $500. Court heard that in October 2012, McCulloch contacted Olinsky and hired him to dredge the shoreline of his property to create a large berm that extended into the water. A conservation officer investigated and determined that the work was performed without a work permit. Justice of the Peace Darlene Hayden heard the case in the Ontario Court of Justice, Gore Bay, on May 2, 2013. The public is reminded that work in or near shore lands often requires prior approval from the Ministry of Natural Resources.